W.R. Mitchell has interviewed over 600 people during the last forty years. A great proportion of these tapes have been catalogued by the W.R. Mitchell Archive at Settle Stories Ltd., and are now housed in the North West Sound Archive, but over 66 tapes are housed in the University of Bradford Special Collections, and another 100 are currently housed in the University of Leeds Special Collections. We have digitised only a small proportion of the tapes so far, but our aim is to digitise them all, bringing together in one collection the vivid oral histories of Yorkshire and Lakeland folk. The range and breadth of the full collection is astonishing, ranging from local gentry such as Philip Dawson of the Folly in Settle, and the Yorkes of Halton Place, to Jim Smith, a hill farmer near Ingleborough, and Sam Dyson, a farmer on the Haworth Moors, both struggling to make a living out of the harsh climate of the Yorkshire Dales. Kit Calvert and Norman Swindlehurst's memories of life in small Dales communities in Hawes and Keasden are a delight, as are Thomas Dugdale's recollections of early cinema in Settle. 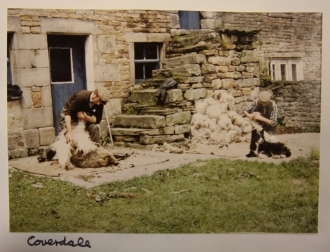 John Geldard's recollections of the ancient art of dry stone walling and Henry Cox's memories of life working in cotton mills illustrate two sides of daily work in the Dales in the early 20th century. Bill Alderson describes the life of Susan Peacock, a landlady of the Tan Hill Inn in the early part of the 20th century, and Lawence Rukin talks about singing in the ‘Keld Singers’, whilst John Keavey describes early recreational cycling in the Dales. Alice Maunders records life as an ‘Inbetween Maid’ in a large household in Stackhouses, whilst Ann Margaret Mason records life as a farmer's wife, including baking, laundry and other housework. Finally Marie Hartley and Joan Ingilby talk about the ways in which they recorded and documented Dales life, starting in the 1920s. We hope you enjoy listening to the voices of these people in the short audio clips we have uploaded.